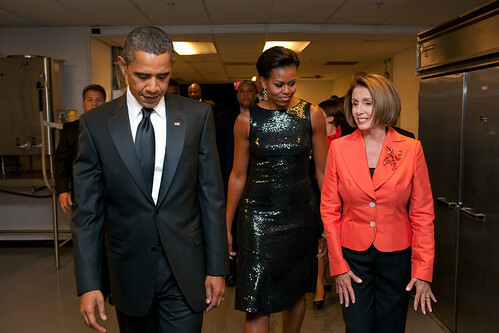 New White House photos on Flickr provide a second look at our favorite dresses of recent weeks. In the top photo, Mrs. O wears a sequinned Michael Kors frock, worn for the Congressional Hispanic Caucus Institute's 32nd Annual Awards Gala in Washington, D.C. In the second photo, Mrs. O wears a cobalt blue dress by Jason Wu as she meets former Olympic gymnast Nadia Comaneci. Note the fantastic detail on the crocodile print fabric. Update #1: We've also added a photo from the gymnastics demonstration that took place on the White House lawn in mid-September. Grazia Fashion has reported that Mrs. O's skirt is Erdem, noting that the designer is "known for his painterly approach to print and colour, and elegant ladylike tailoring." We recall that someone from Mrs-O.org spotted the designer as Erdem a few weeks ago and noted it in the comments. Please remind us who - we'd like to give you recognition! Update #2: That person is Ari. Hooray!